First off, The Homesman by Tommy Lee Jones. Having just read the intriguing short blurb about the film before the festival, I had actually not realised it was a western! In it, Hilary Swank plays Mary Bee Cuddy, a strong willed pioneer given the task to drive a wagon with three women suffering from various degree of insanity across the country. Along the way, she enlists the help of wandering low-life George Briggs (Tommy Lee Jones) with whom she forms an uneasy but growing alliance. The Homesman is a curious film. It is not as radical as the director's previous effort, The Three Burials Of Melquiades Estrada. But it is not quite as Oscar bait-y as it might appear at first. Yes the performances do seem to be calibrated for the awards season. But then the film is peppered with unexpected and sometimes jarring tonal shifts, merrily switching back and forth from broad humour to some very dark moments. Hilary Swank might have a third Oscar in mind but that does not make her performance any less remarkable. Her character is one of contradictions and depth. She is a woman born in the wrong century, deeply religious (the compassionate kind), strong and smart, at once completely in charge of her own destiny and seemingly independent, and yet desperate to marry. It takes a lot of acting skill to make her impromptu marriage proposals shift from the comical to the touching within the same scene, and Hilary Swank delivers another strong yet effortless performance. Some were annoyed after the screening when the term feminism was bandied around, but I do believe it is appropriate to call this a feminist western, within the frame of what the era allowed women to be and their numerous struggles. Tommy Lee Jones as a cantankerous old man with, just as you'd expect, a good heart in his own ways (he's not afraid to unleash some terrible violence when faced with injustice) has fun with his character even though there is not quite as much depth to him as his female co-star. There is a lot to enjoy in The Homesman, even if some of it is a little obvious. The fun and prickly banter between Hilary Swank and Tommy Lee Jones has echoes of African Queen, but it is often in the quieter, less scenes that the film impresses. The three insane women do not have that much characterisation but each of the three actresses still shine, and there is a particularly poignant scene involving the three of them and Tommy Lee Jones that almost had me in tears because of what it so subtly evoked. Shame to film had to finish on a bizarre note, as if Tommy Lee Jones did not know how to finish his film and made it up on the spot (think the ending of Tim Burton's Alice In Wonderland). And as enjoyable as it is, it does not reach the moral depth of more illustrious westerns. Many were getting annoyed on Twitter today when hearing about Oscar talks so soon, referring to The Homesman. But such is the nature of the business, and besides, the unofficial Oscar season starts well before Cannes, at Sundance in January, so it would be very naive to ignore it. The film was generally well received according to the tweets I read right after the screening, so at this early stage I did wonder if it would keep its modest momentum or vanish come the awards season. So on to Turist by Ruben Ostlund, or Force Majeure as it is also called, showing at Un Certain Regard. I took a gamble on that one, and seeing the press queue empty at Theatre Debussy as the film was about to begin, I just walked in. Getting in a film not knowing the first thing about it is often the way to go for those with a modicum of curiosity, especially in Cannes where you expect the cream of the crop to feature. And most of the times it works. But for the second day in a row, after Les Combattants yesterday, it was not to be. I hadn't seen the director's previous film, Play but reading about in retrospect and given its heavy-going and abrasive concept, I would have rightfully been wary of it, and after this one, I'm in no rush to ever discover. One of the quirks of Un Certain Regard is that some films only have one screening, at 11am in the morning, meaning a red carpet gala screening and the cast and crew in tuxedos and evening wear. And I was pleased to see Brady Corbet being part of the cast and present in Cannes (only to discover it was to be his second cameo in as many days, a bizarre casting move which I still cannot explain). I must admit that I am no big fan of satires generally, especially those about middle class, which I find as grating as middle class people themselves. Yes it is very easy to target a particular social group, point the finger at them, laugh at their flaws with the whole audience guffawing in that knowing, "it's so true" laugh. But I prefer a more complex and subtle look at human condition, which is too rarely found in that genre. Turist follows a Norwegian middle class family on a ski break in the French Alps. 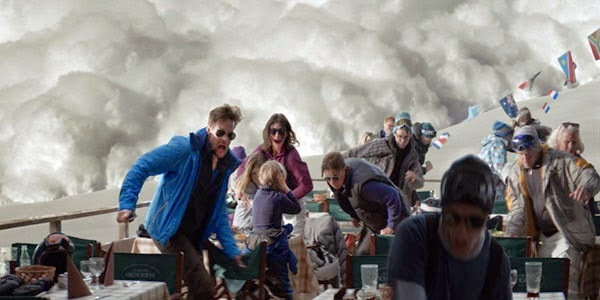 The director establishes his premise early on with an impressive scene: as they are having lunch on a terrace of a restaurant, a controlled avalanche across the mountain takes more momentum than expected and nearly ends up crashing into the crowd. In the growing panic, the father flees with scant regard for his family while his wife frantically tries to ensure her brood his safe. This scene is filmed in a static, one take shot and is truly unnerving as the rambling snow is shown approaching slowly at first but surely, and the panic rapidly sets in. This is how I suspect natural disasters really happen, the disbelief at first, and then the slow realisation that something terrible is about to happen. While the family is unwilling (or unable) to discuss this near drama in the immediate aftermath, the act of cowardice from the man you would expect to be protecting his family, soon snowballs (pun intended) as recrimination and animosity ensue. 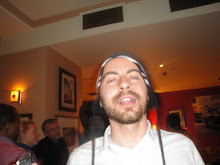 What follows is a rather irritating exposé of modern male anxieties within the confine of a fairly affluent social background, which does not seem to have any particularly interesting idea or much to say. Yes the man is a coward who not only fled at the first sign of danger but also seems to be emotionally articulate, and unable to face his poor decision. As such, he becomes more annoying as the film progresses, and there is no depth to him. There is the recurring figure of a silent caretaker who always seems to appear at the most inopportune moment and witness the family frailties, as if he was a silent witness who rises above the unimportant woes of a "higher" social class. The premise could have delivered a much more interesting film about the place of men in an ever-changing society, and civilisation versus primary instincts, but all of it is barely explored. Worse, nobody seems to have any redeeming features, which is a problem I have with most satires. The "main" film of the official selection is shown first at 830am in the biggest screen of the Palais, the Theatre Lumiere, which, with 2300 seats, holds more than enough space for any journalist to get in as long as they get there reasonnably early. But ironically, the second and "lesser" film of the day in the official competition is only shown to the press the day before in a smaller screen with half of the capacity, with a separate queue for each colour. And I was about to discover what it entailed... Despite posting myself at the front of the yellow queue two hours before the start of the film, being pretty much first, I anxiously waited and waited as I saw the "white", "pink", and "blue" queues grow and grow dramatically, scarily even, then saw each of them go in, until after only a handful of "blue" badges were allowed in, the screen was full and we were turned away. Intriguingly, there is sometimes a third and "smaller" film showing in the official selection, which gets a single industry/press/gala screening at 430pm, in Theatre Lumiere, meaning it is nearly as easy to get in as the early morning one, despite it being a red carpet event. The quirks of the festival. But fear not, there are many opportunity for me to catch up on Maps To The Stars throughout the festival and I make it my mission to watch it and review it. It was time to call it a day however.